Are you looking for the perfect All Terrain Vehicle to add to your collection of outdoor toys? The convenience and fun of a 4 wheeler make them one of the best ways to get around your yard or the trails. We had our experts research and review the best 4 wheeler ATVs to bring you a top ten list of the most durable, quality options on the market. Before you start shopping, take a peek at the specifications we outlined, so you know what to look for. Volts: You’ll want to know what type of battery you’re looking at, so we’ve recorded the voltage in this spec for each model on the list. Make sure you find the right capacity for your needs! Age: If a specific option our list catches your eye, check this spec to determine if it’s made for you or your favorite little rider. We’ll specify if the ATV you like is for kids or adults. 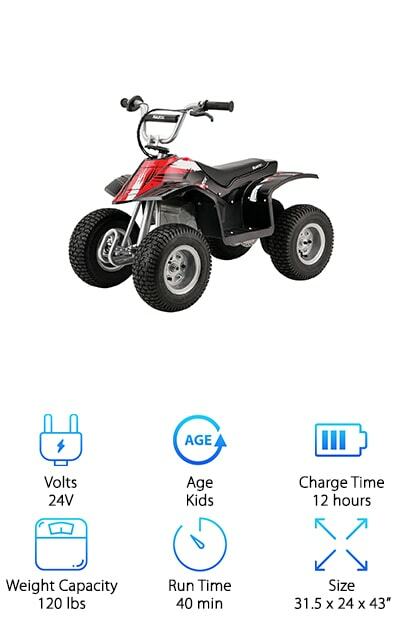 Charge Time: When the fun ends, your 4 wheeler will need to charge to get ready for your next adventure. Check this spec for the deets on how long you need to wait before you’re up and running again. Weight Capacity: Some of our options are made for kids, but could hold an adult in a pinch, too! Whether you’re seeking a model for your toddler, or you’re looking for a teenager, check here to be sure you end up with what you need. Run Time: How long will the fun last? We’ve done careful research to determine how many minutes or hours of consecutive run time can be enjoyed in between charging or refueling. Check this spec for the details. Size: Dimensions can tell you how much space your new 4 wheeler will occupy in storage, and also how much room exists on the back for you or your favorite little rider. We’ll let you know all the measurements here. You’re ready to start shopping, now that you have the right specifications in mind. Every model on our list is a quality product that surpasses the average design, so keep the specs in mind and choose at your leisure. If you’re in a hurry, check out our top and budget picks, both of which provide the ultimate experience. No matter which model you choose, you can be sure you will end up with the best four wheeler for you! 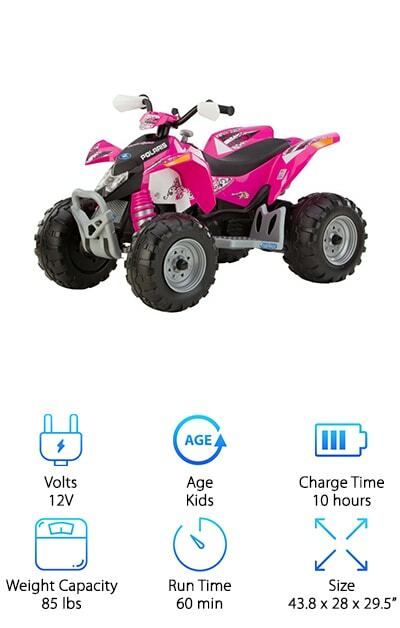 The Power Wheels Kawasaki model makes our list as the perfect pick for the Barbie princess in your life! Its low design, foot rests, and roomy seat provide a comfortable place for your child to learn how to maneuver a 4 wheeler. Even better, it fosters motor skills, independent play, and creativity. Equipped with a high speed lock-out feature, it’s ideal for beginners and easily drives over rough terrain, pavement, and wet grass. Forward speeds reach 6 mph max and go up to 3 mph in reverse. And you can rest easy, thanks to the power lock brakes that keep your little one safe. The bright pink and teal design is complemented by Barbie decals and will dazzle even the toughest little critic. 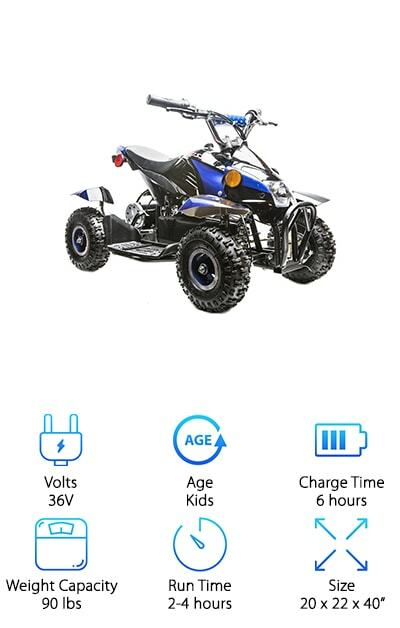 Complete with its own 12-volt battery and charger, your little rider can go for about a half hour between charges. Open up a world of fun and exploration today with this sweet ATV! Our budget pick, the Best Choice, delivers quality and affordability as our pick for the best cheap ATV and is sure to delight the lucky kid in your life! This durable, realistic-looking red and black model features large plastic tires with imitation chrome rims and rugged curves that mimic the most extreme vehicles used by grown-ups! Built-in LED headlights turn on with the push of a button, adding to the realistic all terrain experience and making night riding a blast! With a maximum speed of up to 2 mph, you can be sure your little one is getting a kick out of the ride and you can keep up for safety reasons. Even better, they can easily change directions with the integrated forward and reverse gear shift. 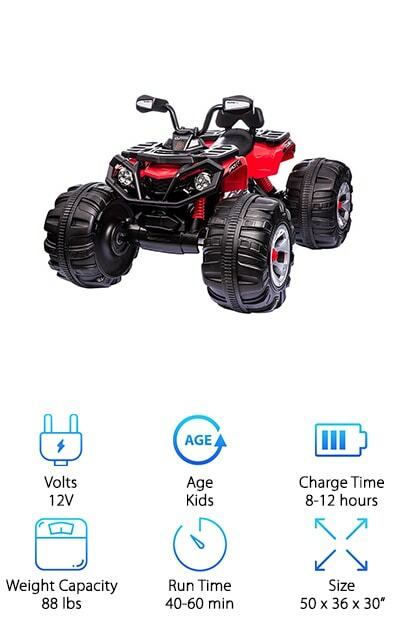 A 12-volt rechargeable battery gives about a half hour of non-stop run time, so you favorite little person gets a nice chunk of ride-along fun. If you’re looking for an authentic youth ATV for sale, then look no further! The Razor is a miniature electric off-road dirt quad that boasts realistic geometry and design and features 13 in. pneumatic knobby tires! Your favorite little rider can drive this baby off-road, hitting up the trails and all the best 4 wheeler spots. The high torque motor allows your child to keep pace with you at a max speed of 8 mph. And enjoy up to 40 minutes of continuous use, thanks to the 24 volts of battery power. A terrain-tracing rear suspension, complete with a coil shock, makes for a smooth ride. And your child will feel like a true extreme sports enthusiast, thanks to the twist-grip acceleration control and hand operated rear disc brake. Recommended for ages 8 and up, the Razor can support up to 120 pounds, so you might even be able to take it for a spin! When it’s time to kick your child’s outdoor experience up a notch, this ATV delivers. Your kids will have a blast on this authentic-looking children’s ATV! With shocks, fenders, and knobby tires, the Peg offers a realistic experience to captivate your little ones and brings a world of adventure on wheels to their doorstep. Boasting safety features like the ability to control the speed your child is able to reach via a lockout control, and automatic brakes, you can relax and let them enjoy the ride. Capable of reaching two speeds of either 2.5 mph or 5 mph, thanks to the gearshift, your little rider will get a kick out of outdoor playtime! Even better, they enjoy the added ability to reverse, so they feel like real riders. Perfect for kids ages three to seven, the Peg can hold up to 85 lbs, so you can expect several years of use. 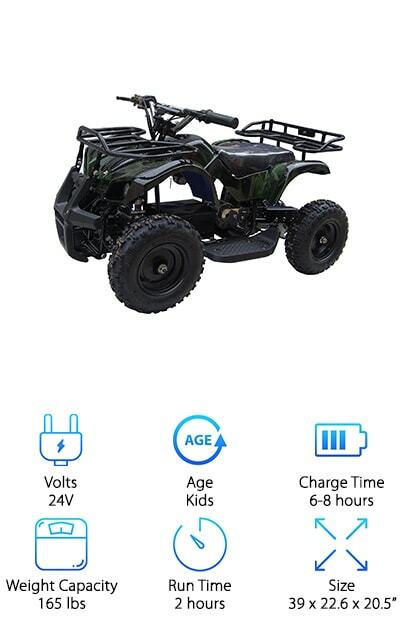 If you’re looking for an electric four wheeler that will grow with your children, this is a great option. Explore the world in style on the Mountopz Four Wheeler! The tree camo color gives this authentic ride the perfect look for trails and the woods, but it only gets better from there! An automatic transmission, electric start, and durable 6 in. tires put the Mountopz in line with the best adult ATVs in a miniature version. Safety features like a remote control shut off and foot brake provide peace of mind, as your child keeps pace with you or explores the yard. The all-black design looks stylish and sleek and pairs well with a sporty rider’s helmet and gloves. And get this: a rack on the back allows you to bring luggage and belongings, so pack that picnic or camping tent and head to your next adventure! If you love to ride as a family, you won’t want to miss this quality product at an affordable price. Your child will be over the moon in gratitude! Your kid will love the Yukon Trail mini quad 4 wheeler for its sleek design and twist-style handlebar, complete with a mounted throttle and accelerator. You’ll rest easy, thanks to the parental speed control feature. 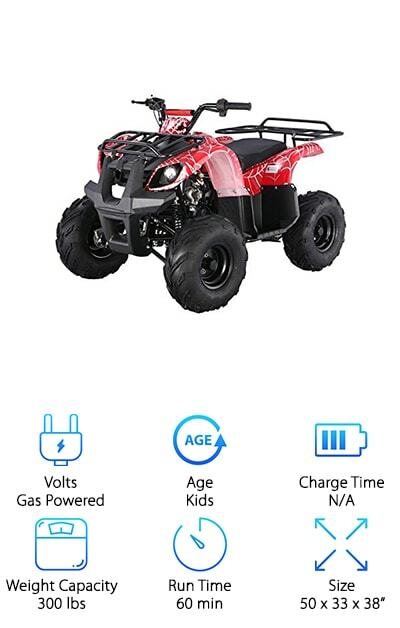 Watch your little star travel in forward and reverse on this stylish, authentic-looking model that accurately mimics the look of extreme all terrain vehicles. 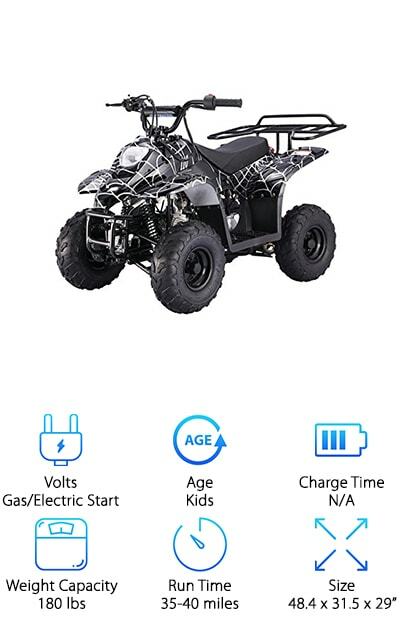 Perfect for kids ages five to nine and folks weighing up to 165 lbs, the Yukon makes our list as one of the best four wheeler ATVs on the market. A foot-activated safety switch keeps your precious cargo riding and stopping with ease and a working front headlight offers a cool effect and an even safer ride at night. The tough, steel frame means the Yukon will last for years, so you want to seriously consider this if you have a younger sibling who will be looking for a hand-me-down in years to come! 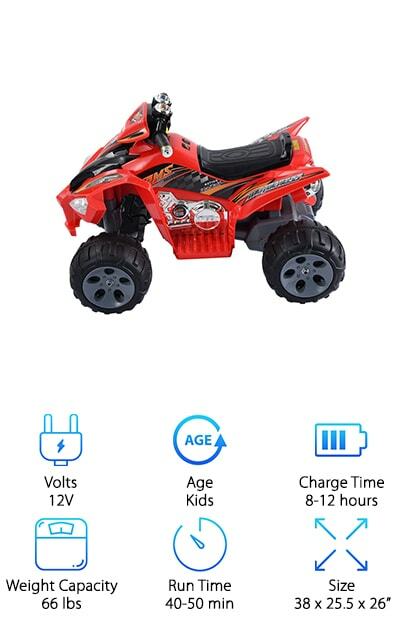 The only issue we see here is going to be getting your child to come in for dinner since this model runs consecutively for up to two hours when fully charged! If you’re searching for the best ATV for your favorite little rider, then look no further! The Costzon delivers all the bells and whistles of an authentic 4 wheeler at an affordable price that won’t break the bank. It will give your kids the thrill of extreme sports, without provoking your anxiety! This durable design conquers your backyard with ease and provides the experience of real all terrain riding, thanks to its over-sized wheels, flat seat, and authentic-looking handlebars. With speeds between one and four mph, your child can zoom around the yard or take a slow and steady pace. A reverse feature lets the rider go backward at a slow rate. Controlled by a foot pedal, kids can easily stop and go at their leisure, providing a comfortable experience that begins and ends easily when the rider is ready. And here’s the kicker: an auxiliary input allows you to connect your phones and other devices to play music during the ride! Don’t settle when you’re looking for the best mudding ATV for your kids. Complete with a set of four tires and a suspension perfect for all terrain driving, the Tao Tao delivers a premium four wheeling experience for any lucky rider. Even better, it’s capable of holding up to 300 lbs or more, so you can take it for a spin if the mood strikes! Authentic controls, including a front hand brake and rear drum foot brake, make this model a leader in safety and realistic design. Forward, neutral, and reverse gear shifts give the rider dominion over the area covered and open up a world of exploration and options. If your child is experienced or older and ready for a real riding experience, then the Tao Tao is the perfect companion! Take advantage of the front and rear racks, which allow you to take luggage on the go. All you need is your own ATV and you can ride off into your next escapade together! When you’re looking for the perfect 4 wheeler to add to your child’s outdoor toy collection, you want to be sure it’s sturdy and fun! Designed to give you peace of mind, while providing a realistic riding experience for your favorite little person, the Giantix features a durable plastic body in an authentic design! Your child will enjoy being able to travel forward and backward and turning left and right! LED headlights and realistic sounds give the feel of a true all-terrain vehicle! Reaching speeds of one to three mph, your little rider will enjoy a thrilling jaunt across the yard, while you easily keep pace. Perfect for kids ages three to eight, the Giantex grows with your family, making it well worth the affordable investment. If you’re still on the hunt for the best 4 wheeler for your little adventurer, you can end the search now! All-terrain rubber tires and a shock-absorbing suspension land the Rosso among our favorite brands of four wheelers for kids. 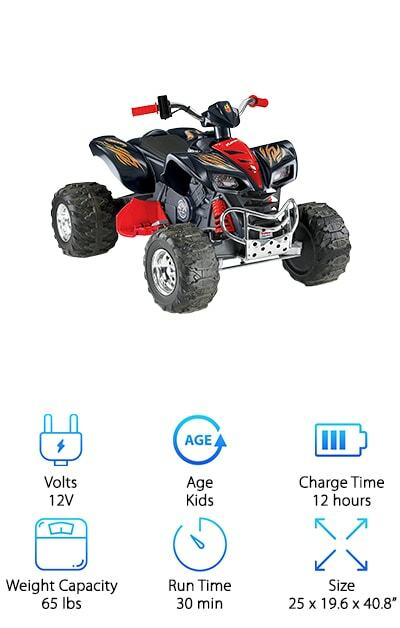 A 36-volt battery and 500-watt motor provide exceptional power, so your little one can enjoy the ride of his or her life! 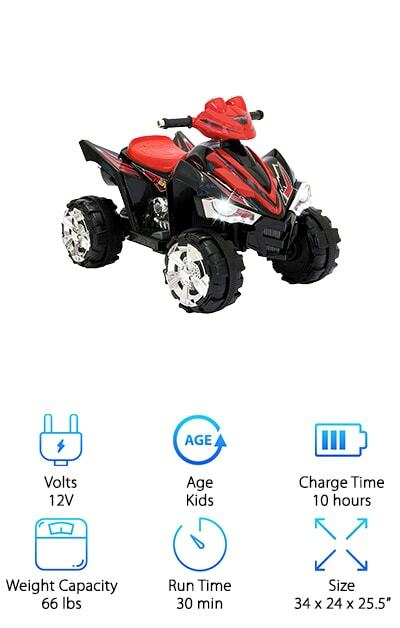 Perfect for kids ages three to eight, your favorite little rider will get the learning experience of realistic features, such as all-terrain rubber tires and the ability to reverse. But, rest assured you will have the final say in how fast your kiddo goes, thanks to a 3-speed governor system. And breathe easy, knowing your child is riding in style with a disc braking system on both the front and rear. Ideal for families who love the great outdoors and enjoy riding together, the Rosso provides the ultimate experience for any young enthusiast. Likewise, if you want to provide a realistic experience for your child around your backyard, you can’t beat this design or the price!